One of my favorite meals as a child was my Mom’s salmon patties. It was one of the only ways she could get me to eat fish! I’m happy to say that my tastes have matured and now I love fish. Salmon happens to be one of my favorites, so I always have some canned salmon in my pantry. We try to eat fish at least once a week. Not only to derive the health benefits associated with Omega 3 fatty-acids (EPA and DHA), but also to get a break from the regular rotation of chicken, beef, and pork! If fresh, wild-caught fish isn’t available at a decent price, then salmon patties are on the menu. Most recipes for salmon patties call for bread crumbs or wheat flour to act as a binder. I’ve been gluten-free for almost 5 years now and have found a few ways to get around this issue — coconut flour! Coconut flour is very absorbent and fibrous. I think it makes a great substitute for wheat flour or bread crumbs. However, because it soaks up so much liquid, you can sometimes end up with a dry and crumbly end result. That’s where the sweet potato comes in. It gives some moisture to the patties while also helping to bind the ingredients together. Don’t worry about the sweet potato flavor taking over the dish. You won’t even know that it’s in there! I’ve been making my own mayonnaise for years and I love that I am in control of the ingredients. It takes hardly any time and all you need is a blender. If you want to fancy it up, add some garlic and call it aioli! I love experimenting with mixing in different spices and herbs to compliment the dish I am serving. This Chipotle Aioli is subtly spicy and smokey. Perfect for the salmon patties! I recommend making the aioli first to allow the flavors to meld. Add the egg yolks, lemon juice, dijon mustard, and pinch of sea salt to a blender. Blend on high until just combined. Add in the minced garlic and blend on high for 5-10 seconds. Now comes the trickiest part - drizzling in the olive oil! Remove the cap in your blender lid and slowly pour in the olive oil with the blender on a medium high speed. This should take about a minute. Scrape the aioli into a serving dish and stir in your spices. In a large mixing bowl, combine all of the ingredients for the salmon patties except for the coconut oil or ghee. Using a large spoon or your hands, throughly mix the ingredients and break up the large chunks of salmon. Now it's time to form the patties. I like to use a ¼ cup measuring cup to portion out the patties. Using your hands, roll the portioned out salmon into a ball, pressing and squeezing firmly. Place the ball onto a platter and gently press to flatten them slightly. If you see them breaking apart, just put a little more force into pressing them together! Once all of the patties are formed, melt enough fat in a ceramic non-stick pan to evenly cover the bottom. Once the fat is hot, add the salmon patties and fry for 3-4 minutes per side or until lightly browned. You will need to do this in batches. Keep them warm in the oven while frying the rest of your patties. 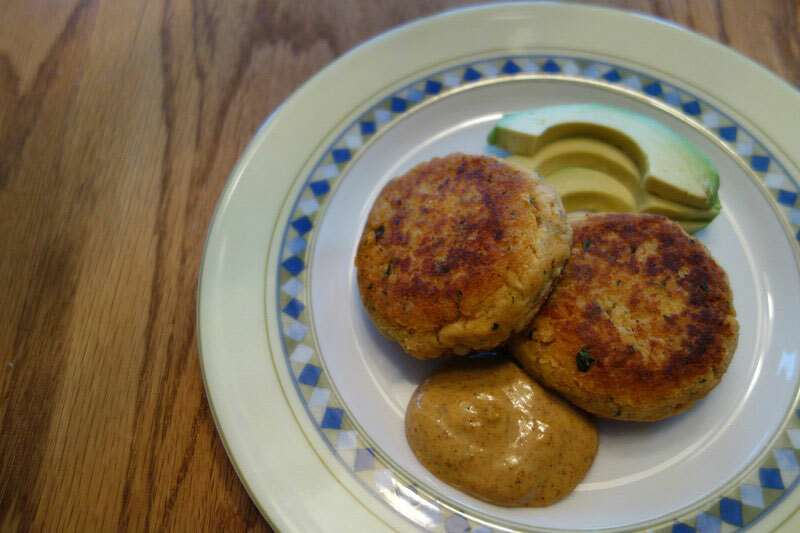 Serve the Chipotle Aioli along side the Cumin Spiced Salmon Patties. I love this dish with a side of avocado and some sauteed zucchini or peppers. Enjoy!! These sound terrific! I’m pinning them to try soon! Looks like a great recipe and I love salmon croquettes, as we called them. However I am avoiding nightshade so can’t use the potato. Have you ever tried a different starch…maybe rice? Sorry! I missed that it was sweet potatoes! Looks great and I will definitely try this.